Intricate tones like a studio master quality sound source are reproduced with exceptional quality and natural depth, thanks to this Blu-ray player’s compatibility with high-resolution audio files over a wireless home network. With a super-compact body and a sophisticated design, this 2D Smart Network Blu-ray Player complements well with the modern home ambience. Thanks to its external USB HDD playback feature, the Panasonic Blu-ray Player lets you play a variety of music files and camcorder videos on the big screen. This compact Blu-ray player is compatible with a wide range of multimedia and offers smart networking for easy access to Netflix, YouTube and more. It even features photo and video playback from external HDD storage. This clever Blu-ray player is compatible with a wide variety of formats, including high-resolution audio files from a wireless home network. This means that intricate tones, such as those of a studio master quality sound source, are faithfully reproduced with natural depth and true-to-life sound. You can play your music (WMA, DSD, FLAC, MP3), photos (JPEG, MPO) and camcorder videos (MP4) on the big screen, thanks to the (NT File System) format external hard disk drive playback compatibility. * This image shows the DMP-BD84. *The external HDD with capacities of 4TB or less in processing NTFS/ FAT32 data is supported. Playback is not possible with some external hard disk drives. A super compact body and stylish design mean that this Blu-ray player is perfect for any space. In fact, we’ve reduced the width of the body by approximately 7cms over our previous model to give you greater installation flexibility. Thanks to a simple home screen internet app deck, you can easily access your favourite online content. 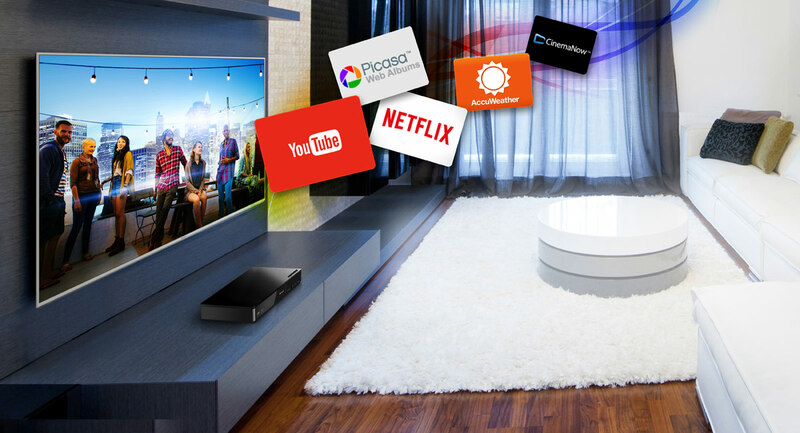 Watch Netflix movies and YouTube videos, check out the weather and news, play games and music – the choice is yours! Intricate tones like a studio master quality sound source are reproduced with exceptional quality and natural depth, thanks to this Blu-ray player���s compatibility with high-resolution audio files over a wireless home network. A super compact body and stylish design mean that this Blu-ray player is perfect for any space. In fact, we���ve reduced the width of the body by approximately 7cms over our previous model to give you greater installation flexibility. Thanks to a simple home screen internet app deck, you can easily access your favourite online content. Watch Netflix movies and YouTube videos, check out the weather and news, play games and music ��� the choice is yours! *3 To enjoy 4K Upscaling playback you will also need a 4K/UHD TV. *4 Only BD-Video 24p content can be up-converted for 4K2K resolution. *5 This function is effective only when reproducing AVCHD data recorded with x.v.Colour technology. The function cannot be used with BD-ROM or DVD-ROM discs. HDMI connection is required. *6 Compatible with AndroidTM devices, Ver. 4.2 and above and Miracast certified. For information on whether the smartphone, etc. supports Miracast, contact the manufacturer of the device. *7 Requires broadband Internet service. *8 The external HDD with capacities of 4TB or less in processing NTFS/ FAT32 data is supported. Playback is not possible with some external hard disk drives. *9 To enjoy content, you will need to insert a USB flash drive (1GB or more of free space/ sold separately). Requires broadband Internet service. *10 Excluding the projecting parts and the pedestal. are trademarks of Blu-ray Disc Association. Manufactured under license from DTS Licensing Limited. and DTS-HD Master Audio is a trademark of DTS, Inc. © DTS, Inc. All Rights Reserved.